I've just bought this 15 mm DBX baggage element from eBay. It's a couple of Essex camels painted and based by Steve Dean. 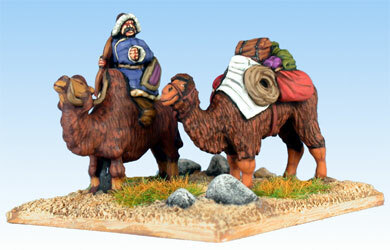 Steve's a very famous, and talented, painter of miniatures with interests in camels and Charlton Athletic. I treated myself to this item to study Steve's technique close up. The brushwork is really excellent as is the choice of colours. There is an "inner light" to the piece. Now all I have to do is to try and match it.